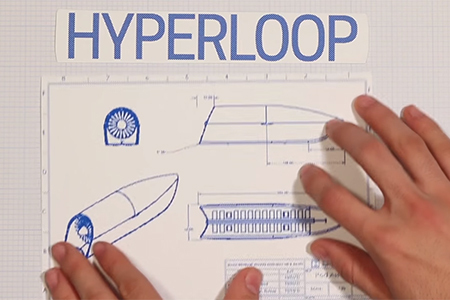 When Elon Musk first made public his idea for the Hyperloop — an ultra-high speed ground transportation system that would rocket passengers hundreds of miles through a tube — some thought he’d gone off the rails. But Anshuman Kumar, who was in India preparing to embark on a Carnegie Mellon education, leaped at the opportunity to do something groundbreaking during his time as a student. Musk, the CEO of SpaceX and Tesla Motors, called on universities around the world to compete to design and build the best Hyperloop pod. One month before Kumar even arrived in Pittsburgh, he’d already recruited half a dozen team members eager to accept the challenge. Musk envisions the system to be a cross between the Concorde jet, a railgun and an air hockey table. Extremely low air pressure inside a network of tubes spanning hundreds of miles would allow pods filled with people to zoom through them at transonic speeds. The pod designed by CMU’s Hyperloop team, which has grown to 50 engineering, design and business students at Carnegie Mellon, made it to the semifinal round of the Official SpaceX Hyperloop Pod Competition based on a document they submitted detailing aspects of their pod’s levitation, propulsion, structures, navigation, communication and safety. SpaceX deemed it as a "solid and impressive" design briefing. Next, the team hopes to secure a spot in the top 10 on Jan. 29-30, when they present their final design package to engineers from SpaceX and Tesla Motors and university professors at Texas A&M. But first, they need funding to conduct some preliminary research. Their funding goal is $20,000, which would cover their budget for testing and prototyping before the end of January. “We need to simulate the conditions for levitation of the assembly. We need to put together a test rig that will allow us to generate quantitative proof to substantiate our designs before we can move to the final round and actually build our pod,” said Shishir Gupta, the team’s air bearing expert. Once the team determines the pod can float, they’ll need to slow it down. That will require the use of magnets, since the pod is not actually touching anything in the tube. So far, the team has been primarily sponsored by CMU’s Mechanical Engineering Department, which has provided space for them to work. Assistant Teaching Professor of Mechanical Engineering Satbir Singh is the team’s official SpaceX adviser, helping out with technical issues. Integrated Product Design Professor Julian Lion Boxenbaum has been guiding the team with design strategy and administration from the start. "The commitment these students have shown has been astonishing, given that this project has been outside of their coursework, has had a nearly impossible timetable, and requires financial resources that are difficult for students to come by," Boxenbaum said. "I hope people will recognize this effort and even participate. With the right kind of support, to our crowdfunding campaign, for example, I think we have a great chance of winning this competition." The competition is being held at half scale, primarily to reduce the cost and complexity of the designs. However, a full-scale pod would hold around 20-30 people. 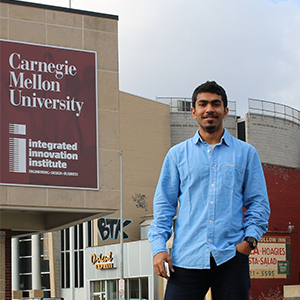 Kumar will graduate from Carnegie Mellon in 2016 with a master’s degree in Integrated Innovation for Products and Services. If you’d like to contribute funding or read more about the project, visit the Carnegie Mellon Hyperloop crowdfunding page.